Worm composting, or vermicomposting, is typically done indoors in a closed bin populated with red wiggler worms. Inside the bin, worms eat organic waste and expel it as worm castings, or droppings. The worm castings, together with other decomposed organic material, make up what is known as vermicompost – a nutrient-rich material that’s great for your plants and garden. Worms are nature’s recyclers! In their natural setting, red wiggler worms are found working through layers of decaying leaves, compost heaps or manure piles. Having 1000 pet worms is fun, but there are many other great reasons to start vermicomposting at home! Recycles our food waste into nutrient-rich compost. Is a convenient way to compost indoors, all year round. Is a composting solution for those living in apartments. Produces compost for your plants and garden in less than 6 months. Is a fun way to get your children and friends involved in composting. Bin Size: The size of your bin depends on the number of worms you have and the amount of organic waste you produce. The bin should be deep enough to fully bury organic waste and have a large enough surface area to rotate the feeding location. A typical household vermicompost bin measures approximately 24 x 16 x 12 inches and contains 1 pound of worms. If you are producing more organic waste than your vermicompost bin can accommodate, increase the size of your bin or start a second bin. Reuse, Build, or Buy: Reuse a bin you already have, purchase a plastic bin or build a wooden bin. Whatever type of bin you choose, drill holes in the cover to allow for air flow. Bin Location: Locate your bin where it is convenient and easy to access, such as in or near the kitchen. Worms prefer a constant room temperature (15-25 degrees Celsius is ideal), so it’s important to keep your bin away from drafts and heating sources. Place a rug or piece of cardboard under your bin to provide insulation from cold floors. Shred the newspaper into 1-3 inch pieces. Crush the eggshells. Eggshells make the acidic peat moss more neutral (powdered lime also works) and provide the grit necessary for the worms to digest their food (a handful of soil will also do the trick). Mix the shredded paper with the peat moss. Make enough bedding to fill your bin about 8-12 inches deep. You can skip the peat moss by making your bedding entirely out of paper, or any of the materials listed above. Let water stand for 24 hours before adding it to the mixture, to allow chlorine to evaporate and the water to reach room temperature. Add water to the dry materials. Squeeze a handful of bedding to check the moisture. Little or no water should run out between your fingers and, when you open your hand, the bedding should remain in a ball in your palm. You will need about one pound of red wigglers – that’s about 1000 worms! Gently add the worms to the top of the bedding and watch as they make their way out of the light and into the soil. Once your vermicompost bin is established, your worms will begin to reproduce. You won’t need to worry about overpopulation as your worms will adapt to the space and food that is available to them. For the first 2-3 days after adding your worms, leave the cover off your bin and a bright light on (a lamp or overhead light). Worms are sensitive to the light and will move to the bottom in the dark bedding. Next, replace the cover but leave the light on for another 2-3 days. If you notice a worm or two crawling up around the sides and cover of the bin, gently put them back into the bedding. This is common as they adjust to their new home. Once the worms have settled into the bedding, you can keep the cover on and the light off. The worms may bathe in the condensation on the sides of the bin – this is not a problem as long as the worms stay inside the bin. There are two easy ways to obtain a supply of red wiggler worms – (1) buy them from a worm farm or (2) get them from a friend with an established vermicompost bin. Trouter’s Special Worm Farm in Bay Bulls, Newfoundland sells red wiggler worms by the pound, as well as complete vermicomposting starter kits – which include a bin, a bag of bedding, and a pound of worms. They’re happy to show you around the farm and share their knowledge of worms and vermicomposting. Your vermicompost system will require little maintenance. In fact, the less the worms are disturbed, the more productive they will be. And, unlike other pets, you can go away for up to a month and not worry about their care. Before going on vacation, feed your worms and – if your house temperature will drop below 15oC – insulate the bin by placing a rug underneath and moving it away from exterior walls. Your worms will eat the organic material you add to the bin, including their bedding. Use a covered container in your kitchen for collecting organic waste, such as a 750g yoghurt container. Food waste that has been chopped up and left for a few days will decompose faster. A red wiggler worm can consume up to its weight in organic material every day! Add the same types of organic waste that you would add to an backyard compost bin. Organic waste is anything that was once alive and growing – like a red pepper, a banana or tea leaf. 1. Use your hand or gardening fork to pull back the bedding to create a hole big enough to contain the waste. Avoid using a trowel or shovel that may harm the worms. 2. Add organic waste to the space you have created and cover the waste with at least two inches of bedding. 3. Mark the feeding location with a plant marker or popsicle stick, so you will know where to add the next feeding. 4. Place the next feeding adjacent to the last feeding, so the worms can find it easily. If you picture the top of your bin as a grid, you will want to vary the feeding from one square to the next until you make your way around the bin (see image above). Only add organic waste when the previous feeding is almost consumed to avoid overloading your bin. The amount of worms in your bin. The amount and type of organic waste you add. How well the food is chopped prior to being added to the bin. Your vermicompost will be ready to harvest in as little as 3-6 months. Your vermicompost is ready when it is dark and crumbly, and none of the original bedding or food scraps are visible. You will also notice that the volume of the bedding has reduced. Harvest your vermicompost on a regular basis. If left too long, finished compost can become toxic to the worms. This method is the most labour intensive, but allows you to keep as many worms and worm cocoons in your vermicompost bin as possible. The whole process should take about 2 to 3 hours. 1. Under a bright light, empty the contents of the bin onto a large plastic sheet, such as a table cloth or flattened garbage bag (this can be done indoors or out). 2. Divide the vermicompost into about eight piles and form each pile into a pyramid shape. Let the pyramids sit for about 15 minutes, allowing the worms to naturally move away from the light and down into the bottom of the pyramids. While you wait for the worms to move to the bottom of the pyramids, take the opportunity to mix up a fresh batch of bedding and add it to the empty bin. 3. Starting with the first pyramid, use your hands to scrape a layer of vermicompost from the bottom edges, sides, and top of the pyramid. 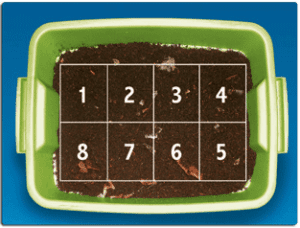 Place the collected vermicompost in a separate container. 4. Continue scraping vermicompost from along the bottom, sides, and top of the first pyramid (removing stray worms and placing them in the fresh bedding as you go) until you begin to see a large number of worms. Reshape the pile into a pyramid and move on to the next. Despite your best efforts, some worms and worm cocoons will get harvested with the finished vermicompost. That’s ok! 5. Continue this process until you have harvested and reformed each pyramid. By the time you get back to the first pyramid, the worms will have moved closer to the bottom and you can begin scraping compost up along the sides and top of the pyramids again. 6. Continue working on each pyramid (you may have to go through the cycle 3 to 5 times) until you are left with eight small piles of mostly worms and a small amount of the original vermicompost. Place the worms and remaining vermicompost in the bin with the fresh bedding. 7. Store the harvested vermicompost in a cool, dark place until you are ready to use it. This method is simpler than the first, but you will retain fewer worms and worm cocoons in your bin. Not to worry, the worms in the bin will continue to reproduce and the harvested worms and cocoons will be beneficial to the soil when you use the finished vermicompost. 1. In a separate container, mix up a fresh batch of moistened bedding. 2. Push all of the finished vermicompost (and worms) to one half of the vermicompost bin. There should be enough space, as the original bedding has reduced in volume. 3. Fill the other half of the bin with half of the fresh bedding mixture. Place your next feeding in the fresh bedding. Continue rotating your feedings as usual on the fresh side of the bin. 4. After about 4-8 weeks, most of the worms will have migrated over to the fresh bedding. Remove the finished vermicompost and replace it with the remaining half of the fresh batch of bedding. 5. Store the harvested vermicompost in a cool, dark place until you are ready to use it. There are many common names for red wigglers including, redworms, trouters, brandling worms, or manure worms. They are recognizable by their alternating red and flesh coloured pattern. Red wigglers are suited for vermicomposting because they are small, quickly consume large amounts of material, adapt well to captivity, and don’t mind being disturbed. Red wiggler worms, also know by their Latin name, Eisenia foetida, are a species of earthworm specially adapted to the environment of decomposing organic material. Red marsh worms, or Lumbricus rubellus, which have a ruddy-brown of red-violet colour, are sometimes grouped with red wiggler worms and are also used in vermicomposting. Nightcrawlers (Lumbricus terrestris) – the worms that surface in your backyard in the early morning or after a rain shower – are not well suited for vermicomposting, but they are great for your garden soil and backyard compost bin. A worm’s tiny body is fascinating. Worms breathe and sense light through their moist skin, pump blood though their bodies with five beating hearts, and grind up food using a big muscle called a gizzard. Worms don’t have lungs, they breathe through their moist skin, which is why they require a moist environment. Worms do amazing work. In addition to decomposing vast amounts of organic waste, their tunneling action allows oxygen, moisture, and nutrients to reach plant roots underground, where it is needed. Red wiggler worms reproduce quickly. Once your vermicompost bin is established, you may notice brownish-yellow or brownish-red, lemon-shaped objects in the bedding, each about the size of the tip of a match. These are worm cocoons! After 2-3 months, young worms become sexually mature. Mature worms are recognizable by the swollen band, called the clitellum, located near their front end. Although worms are hermaphrodites (both male and female at the same time) they need a mate to reproduce. Two worms will join together in opposite directions at the clitellum where mucus secretes, hardens and then passes off the front end of the worm in the form of a cocoon. As the cocoon passes over the worm’s body, sperm and eggs are deposited allowing fertilization to happen inside the cocoon. About three weeks later, 1-5 baby worms will emerge from the cocoon. Baby worms are thin, white and less than an inch long. They look like little threads and will remain white until they produce enough blood pigment to appear red. To find baby worms in your vermicompost bin, look in folds of paper and softer pieces of partially decomposed food. Although red wiggler worms reproduce quickly, you will not have an overpopulation problem in your bin. Worms will only reproduce under the proper conditions and populations will adapt to the amount of space and food available. For this reason, you will notice times of increased and decreased cocoon production. You will not likely notice when worms die in your bin, as their bodies are 70-90% percent water and decompose quickly. Red wiggler worms can live for about one year in nature, but have been known to live up to four years in captivity. Your vermicompost bin will be home to more than just worms. Over time, your vermicompost system will become its own mini ecosystem, as other living organisms – like bacteria, fungi, springtails and mites – begin to populate the bin. These decomposer organisms are not only helpful – they are required to help turn your organic waste into nutrient-rich compost. Bacteria start the decomposition process by secreting a substance that softens organic waste, making it ready for worms to eat.